Contains aloe, vitamin E and skin conditioners. 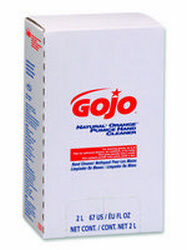 Developed especially for removing soils, common grease, oil and grime. Sanitary-sealed, bag in box dispensing system. Easy to load cartridges minimize waste. Fresh valve with each refill ensures no leaks or clogs.